A System on Module (SOM) offers a unique approach to product development and the often fully custom electronics typically contained within sophisticated devices. A SOM helps system designers realize a fully customized electronics assembly, complete with custom interfaces and form factor without the effort of a ground-up electronics design. Customers can purchase an off-the-shelf SOM and marry it to an easy to develop custom base board to create a solution functionally identical to one that is fully custom-engineered. This method reduces product development costs while shortening time to market and technical risk. Critical Link provides a range of SOM offerings in its MityDSP family. 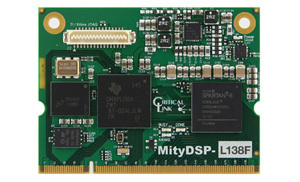 The MityDSP is a series of highly-configurable, small form factor embedded CPU engines. These combine DSP and/or FPGA and/or ARM processors that are optimized for custom data collection and processing, and meet the needs of a broad range of scientific and industrial applications. The System on Module, which is sometimes referred to as a Computer on Module (CoM), is designed to plug into a carrier, or base board, and is generally a small processor module with a CPU and standard I/O capability. The complex effort associated with designing a CPU subsystem is avoided by using SOM functionality and a custom base board. There are two SOM families.